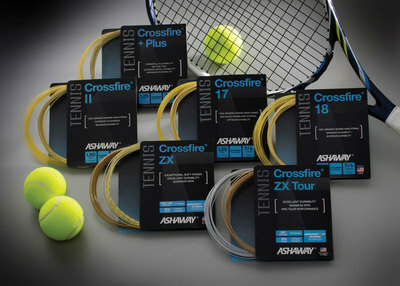 Ashaway, RI - For over twenty-five years now, Ashaway’s Crossfire® hybrid tennis strings have been used by many of the world’s top competitive players. Ashaway’s signature aramid main string, in combination with natural gut, was the first hybrid ever used on the pro tour and even helped win a number of Grand Slams. But because Ashaway is a small company, their strings have not garnered widespread brand recognition. Nevertheless, word of mouth has made them “cult favorites” among the hybrid cognoscenti who continue to insist on having Ashaway Crossfire strings in their racquets. The reason is two-fold. First, hybrid stringing allows players to fine-tune their racquets to their particular style of play, much as legendary baseball players have designed signature bats. They want more spin, more power, better drops, or simply some relief from the arm jarring impact of today’s ultra stiff polyester strings. Second, Ashaway Crossfire strings offer more combinations of main and cross strings — and hence, more ability to fine-tune the playing characteristics of a string bed — than any other brand. Ashaway’s Crossfire family includes six different material and string gauge combinations to suit even the most discerning player’s taste. The earlier models — Crossfire II, 17, and 18 — utilize aramid (Kevlar®) mains and synthetic gut crosses to provide varying degrees of toughness and durability while enhancing playability. Crossfire Plus combines a 1.25 mm (17 gauge) blend of braided aramid and PTFE fibers for the mains and Synthetic Gut with an abrasion resistant wear layer for the crosses. The result is a tough durable hybrid combination with a softer feel, superior resilience, and maximum ability to impart spin. Crossfire Plus is designed for chronic string breakers and top-spin players looking for a hybrid string combination that plays better than a heavier gauge Aramid, but wears just as well. The most recent additions to the Crossfire hybrid line incorporate Ashaway’s increasingly popular 100% Zyex® monofilament strings. Included are Crossfire ZX, which combines Ashaway’s 17 gauge braided Aramid/PTFE Kevlar +Plus mains with MonoGut® ZX Pro cross strings; and Crossfire ZX Tour, which includes Ashaway’s co-polymer string, MonoGut Original, mains with MonoGut ZX for the crosses. Crossfire ZX is the lighter of the two hybrids, combining 1.25 mm Kevlar +Plus mains for superior durability and control with MonoGut ZX Pro crosses. The 17 gauge Kevlar +Plus is a blend of braided Aramid and silky soft PTFE fibers that softens the string’s feel, while the 1.22 mm MonoGut ZX Pro is a 100% Zyex monofilament that has the closest dynamic stiffness to natural gut of any synthetic string and sets the benchmark for soft power and spin. For heavier hitters there is Crossfire ZX Tour. This hybrid utilizes 1.27 mm MonoGut Original co-polymer monofilament strings in the mains for excellent durability and enhanced spin with 1.27 mm MonoGut ZX for the cross strings. This 100% Zyex monofilament maximizes power and improves the feel of the ball. The Crossfire ZX Tour hybrid allows players to experience playability and performance similar to the co-polymer/natural gut hybrid that is so popular on the tour, but with the extra advantage of optimum durability.